Review: Spinning Coin's first album harks back to a hazily golden and summery age of UK indie, in a completely sincere and underivative way. The Glaswegian quintet worked with producer Edwyn Collins for this confident opening statement. With the songwriting split between two members of the band, the album benefits from contrasts in sound, from more angular and rough headbanging moments to softer and more whimsical indie-pop. It's a charming debut, welcoming these newcomers to a long and historic lineage of Glaswegian indie groups. 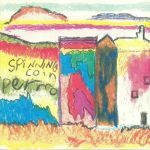 Review: Spinning Coin's first album harks back to a hazily golden and summery age of UK indie, in a completely sincere and underivative way. The Glaswegian quintet worked with producer Edwyn Collins for this confident opening statement. With the songwriting split between two members of the band, the album benefits from contrasts in sound, from more angular and rough headbanging moments to softer and more whimsical indie-pop. Overall, it's a charming debut, welcoming these newcomers to a long and historic lineage of Glaswegian indie groups.